While it's still relatively early days in the roll-out of Fibre to the Cabinet (FTTC) fibre broadband technology in the UK, a new technology is around the corner that will offer significantly higher download and upload speeds. This new technology - known as G.fast - was trialled by BT in the summer of 2015 in Huntingdon (Cambridgeshire) and Gosforth (Newcastle), with new pilot sites in 2016 in Cambridgeshire and Kent. In its results for the quarter ending December 2014, BT stated that it expected to deploy G.fast "at scale", helping to make speeds of up to 500 Mbps available to "most of the UK" within a decade. If the pilots are successful, initial deployment may commence as early as 2016. In September 2015, BT announced that it intends to make G.fast available to about 10 million homes, offering speeds of about 300 Mbps by the end of 2020. Currently, BT Openreach is rolling out an extensive Fibre to the Cabinet network. By December 2014, BT's fibre broadband network was available to around three-quarters of the UK according to BT - almost 22 million premises. By March 2016, BT's fibre broadband network had passed around 25 million premises (representing about 85% of premises). 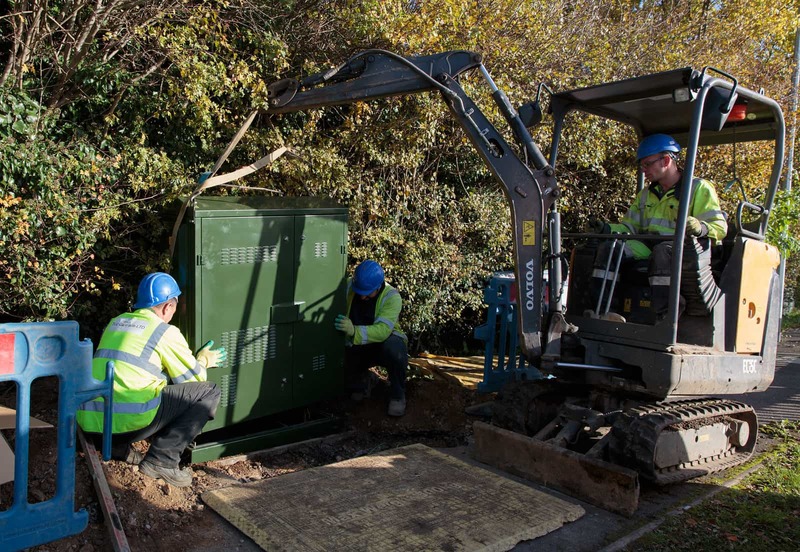 As described in our What is Fibre Broadband page, new fibre street cabinets are being installed near to BT's conventional street cabinets and these are connected to BT's network using fibre-optic cable. With conventional broadband, your modem connects to the Digital Subscriber Line Access Multiplexer (DSLAM) in the exchange. Since an exchange can be many kilometres away, the broadband signal may have to be carried along very long lengths of copper cable, inevitably limiting the connection speeds possible. With FTTC fibre broadband, a fibre street cabinet (like the one shown above) houses the DSLAM equipment. Since these fibre cabinets are generally much closer than the exchange, broadband signals have significantly less distance to travel, and so speeds will generally be much higher than conventional broadband. The technology used to carry the broadband signal along the copper cables is called VDSL2 (Very high speed Digital Subscriber Loop 2). Premises that are situated close to a fibre cabinet may achieve connection speeds close to the maximum (today) of about 80 Mbps (download) and 20 Mbps (upload). an effective solution for premises located a significant distance from a fibre street cabinet, where VDSL2 speeds would be substantially lower than 80 Mbps (download) and 20 Mbps (upload). New! We now understand that BT is looking to initially deploy G.fast capability in existing fibre street cabinets, boosting download speeds to about 300 Mbps for those premises located within a few hundred metres of the cabinet (which can currently achieved download speeds of around 80 Mbps). Significant further investment would be required to deploy additional distribution points (which would need to be connected via fibre-optic cable). The ITU-T founded the G.fast group in 2011 to develop the G.fast standard, which has been supported by several operators, chipset manufacturers and equipment vendors. at a relatively close distance (within about 250 metres) to the premises to be served. It could also be located at the entrance (inside or outside) of a building. In FTTdp deployments, a limited number of subscribers are attached to one fibre node, which acts as a DSLAM. According to Alcatel Lucent, by deploying G.fast at distribution points located 250 metres or less from subscribers, ultra-broadband services can typically be provided to between one and 16 subscribers from each distribution point. More recently, it is understood that there is increasing interest in deploying G.fast in existing fibre street cabinets, to minimise investment costs. This would initially increase the maximum download speed for premises close to a fibre street cabinet from 80 Mbps currently to about 300 Mbps. Compared with VDSL2, G.fast makes use of higher frequencies transmitted along the copper cables, as shown in the table below, to increase data speeds. When BT first launched its VDSL2 FTTC service, profile 8a was selected, which used only 8.5 MHz bandwidth to deliver a maximum download connection speed of 40 Mbps. The use of a wider bandwidth allows VDSL2 to deliver greater speeds for households and business premises situated within about 750 metres of a fibre cabinet. In April 2012, BT implemented the 17a profile (using nearly twice the original bandwidth of profile 8c), allowing download connection speeds up to 80 Mbps. In the future, BT has the option to increase the bandwidth with VDSL2 even further (to 30 MHz), which would increase download speeds to well over 100 Mbps for premises close to the street cabinet. The bandwidth used by G.fast is considerably wider than VDSL2 (about 6 to 12 times wider than current VDSL2 services). The use of higher frequencies inevitably limits the distance of transmission to a maximum of about 250 metres (and significantly lower than this for the highest speeds), due to strong signal attenuation at high frequencies. In the initial stages of G.fast deployment, G.fast technology will use the 106 MHz frequency band, although there will be the option to increase the bandwidth to 212 MHz in the future (to achieve even greater speeds). Due to the frequencies used by G.fast, there will be a risk of interference to other services, including FM radio. Real G.fast deployments may require certain frequency bands to be 'notched out' to avoid interference with other services. With its limited range, G.fast will not replace VDSL2. Alcatel-Lucent sees G.fast and VDSL2 FTTC as complementary and believes that the best approach for most operators will be to deploy a mix of the two technologies. Alcatel-Lucent considers that VDSL2 vectoring will remain the best technology for longer copper lines. As described in our VDSL2 vectoring article, the higher frequencies used by VDSL2 services make fibre broadband services more susceptible to crosstalk interference than conventional ADSL services. Crosstalk interference is the interference to a particular broadband signal from other broadband signals being carried along adjacent copper cables. Crosstalk interference can significantly reduce broadband speeds and a technology, called vectoring, is needed to combat crosstalk. Vectoring is even more essential with G.fast than VDSL2 since the degradation in speeds from crosstalk interference can be even more dramatic. For example, a G.fast connection capable of 1 Gbps speeds with vectoring may only be able to support 200 Mbps or less without vectoring. G.fast needs to use a more advanced vectoring technology than that used for VDSL2 to successfully cancel crosstalk between lines. So why is G.fast being developed when Fibre to the Premises (FTTP) (where fibre is laid all the way to the premises) could potentially provide even better performance than G.fast without its dependence on copper cables? The answer is cost. FTTP can be very expensive to implement (particularly in so-called 'brown field' deployments) with high labour costs. Austrian ISP A1 says that, even though FTTP remains its long-term vision, it considers G.fast as an "intelligent interim solution" until fibre has the same coverage as copper does today. We certainly understand the frustration among some technology evangelists that the current deployment of FTTP is painfully slow since FTTP offers the ultimate in speeds and reliability. However, we have also witnessed the many challenges faced by Openreach engineers (shown below) laying cables in a BDUK project, with frustrating and time-consuming delays caused by numerous blocked ducts. Laying fibre to all homes and business premises in the UK would certainly be a very costly and onerous project! In 2008, Analysys Mason estimated that taking fibre to every UK home would cost as much as £28.8 billion (nearly six times higher than FTTC deployment, which is currently being undertaken). The financial challenges of providing FTTP for BT are clearly demonstrated by its price increases in 2014. In January 2014, we reported that BT Openreach significantly increased its pricing to ISPs for its FTTP on Demand service. BT increased the monthly fee by about 160%, and the variable distance-based installation charge was almost doubled. The large increase in prices clearly signalled BT's lack of appetite for making FTTP a mainstream service with widespread appeal to consumers and businesses given the true costs of installation. While a maximum download speed close to 80 Mbps may be sufficient for many households today, the same was said of conventional broadband services when they were introduced in 2000. Very quickly, applications are developed and adopted that consume substantial bandwidth. According to Telecom Austria, the trend towards higher data rates is mainly driven by the "constantly rising demand for high-resolution TV, video-on-demand and other complex Internet services". According to the ITU, G.fast "will increase the feasibility of implementing bandwidth-intensive services such as Ultra-HD 4k and 8k streaming and next-generation IPTV, advanced cloud-based storage, and communication via HD video." 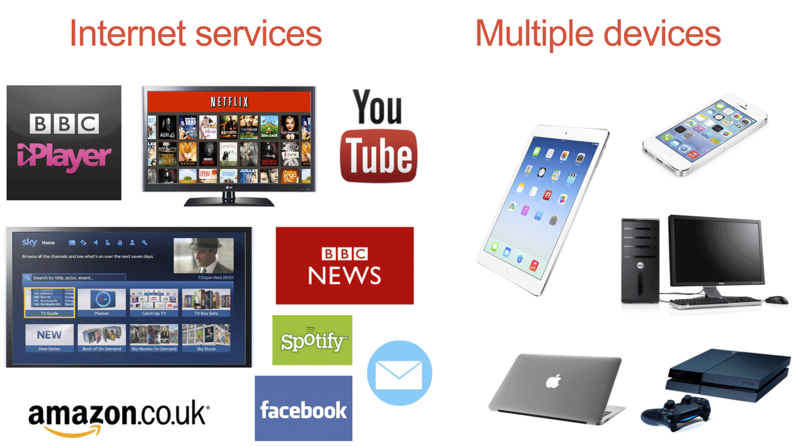 In April 2014, Netflix began streaming 4k video in the UK (requiring a minimum download speed of about 15 Mbps) and it has been reported that BT Sports intends to offer streamed 4k content by the end of 2015. Compared with VDSL2 FTTC, G.fast offers significantly higher peak speeds, approaching 1 Gbps. Download speeds of several hundred Mbps would be more than ample to support services that are currently foreseen . Austrian ISP A1 considers that the data rates reached with G.fast will meet the meeds of even the most demanding households over the next 10 to 20 years. 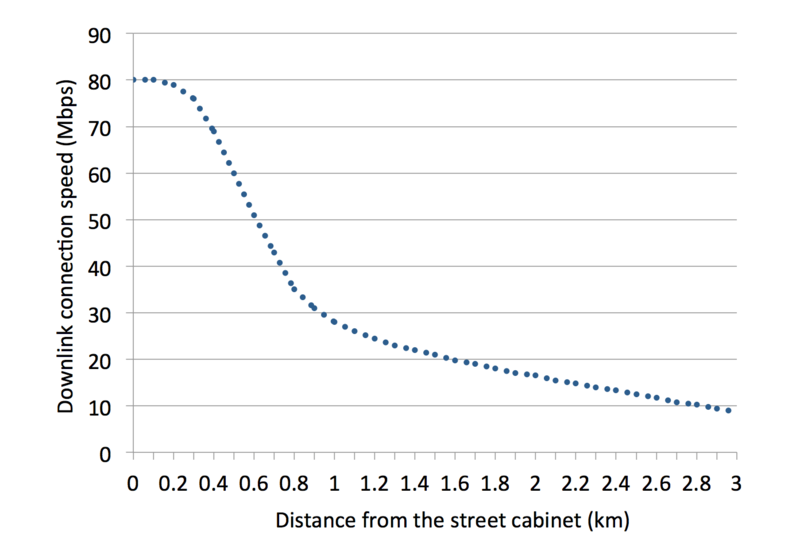 The major drawback of VDSL FTTC broadband services is that the highest speeds are only achieved when located close to a fibre street cabinet, as shown in the figure below. FTTC services still rely on copper cables to carry broadband signals from the fibre cabinet to homes and business premises, and speeds are reduced for longer copper cable lengths. Premises situated within about 400 metres of a fibre street cabinet may be able to achieve download connection speeds in the 70-80 Mbps range. However, premises further away will not be so lucky. Premises around 1 km from the fibre cabinet can expect download connection speeds of about 25-27 Mbps, and speeds will generally fall to about 15 Mbps at a distance of 2 km. G.fast allows the deployment of so-called "distribution points", which can be positioned closer than fibre street cabinets to homes and businesses. While these distribution points still use copper cables to carry the broadband signals, the shorter distance (250 metres or less) permits much higher download and upload speeds compared with VDSL2 FTTC services provided from a more distant fibre cabinet. However, deployment of new distribution points may be much more expensive for BT to deploy than simply upgrading existing fibre cabinets with G.fast technology. Therefore, in the early years of G.fast deployment, BT may decide simply to upgrade existing fibre broadband cabinets with G.fast technology, allowing premises within a few hundred metres of a cabinet to benefit from much higher speeds (about 300 Mbps). However, this will create a much bigger gulf than today in the speeds achieved between those located at a considerable distance from the street cabinet and those located much closer. BT has already undertaken trials of G.fast at Adastral Park, its research and development facility. During the G.fast trials, downstream speeds of around 800 Mbps were achieved over a 19 metre length of copper, combined with upstream speeds of more than 200 Mbps. Speeds of around 700 Mbps (download) and 200 Mbps (upload) were also achieved over longer lines of 66 metres. Below is a video about BT's testing at Adastral Park. G.fast equipment became commercially available in 2015. The Broadband Forum is working with the ITU to ensure compliance with the G.fast standard and certify chipsets and equipment, with certified G.fast implementations appearing on the market "before the end of 2015". In January 2015, BT announced that it would conduct G-fast pilots in summer 2015. The two pilots were in Huntingdon (Cambridgeshire) and Gosforth (Newcastle) and about 4,000 homes and businesses were able to participate in the pilots, which assessed what speeds could be delivered using G.fast "at scale". BT CEO Gavin Patterson said, “We believe G.fast is the key to unlocking ultrafast speeds and we are prepared to upgrade large parts of our network should the pilots prove successful." According to BT, G.fast "will help BT deliver ultrafast speeds of up to 500 Mbps to most of the UK with a decade". Deployment will start in 2016/17, subject to the pilots in Cambridgeshire and Newcastle being "successful". Outside the UK, several operators are looking to trial, and possibly deploy, G.fast technology. By October 2014, Alcatel-Lucent has undertaken 12 G.fast trials with operators, including BT and Orange. Eight further operator trials had been confirmed by the end of 2014. In October 2014, A1 in Austria announced that it had connected the first customer in the world to its domestic broadband network with G.fast as part of a "testing phase". Its launch of commercial G.fast operations is expected in 2016. New! In March 2016, BT announced that it would build on the existing trials of G.fast with new pilot sites in Cambridgeshire (Cherry Hinton) and Kent (Gillingham). These will trial G.fast on a larger scale than existing trials. When the infrastructure for these new trials has been built (during 2016), 25,000 premises in these areas will be able to access download speeds of up to 330 Mbps.